The Erie Canal was arguably the most important transportation system ever built in this country. Only the trans-continental railroad and the interstate highway system can compare in realizing widespread social, cultural & economic change in America. 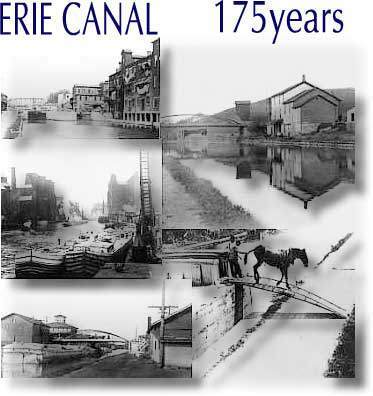 The original Erie Canal was constructed between 1817 and 1825. At a cost of little over 7 million dollars, Governor Dewitt Clinton and the state of New York were able to build a waterway 4 feet deep, 40 feet wide and 363 miles long, connecting the Hudson river at Albany to Lake Erie at Buffalo. The canal was the most ambitious engineering project undertaken anywhere in the country up to that time. The canal was the communication and transportation link between the eastern and western parts of the country. It allowed New York City to become the commercial, financial and immigration center of the country, while opening the west for settlement and industrial growth. The success of the Erie sparked an explosion of canal building all over the country. The canal carried millions of tons of freight, but freight wasn't all that was carried. The canal allowed people with their thoughts and ideas to travel rapidly throughout the country as well. Social reform movements including Women's Rights and abolitionists and numerous religious groups sprang up along the waterway, taking advantage of the rapid communication provided by the canal. The canal remains an important asset in New York. Its history, legends and lore enrich the story of New York State. Today thousands of recreational boaters enjoy the canal system, impacting our economy in a way Dewitt Clinton never dreamed of. The story of the Erie Canal continues and its final chapter won't be written for quite some time.